KINSHASA, 14 November 2007 (IRIN) - Analysts have welcomed the latest in a series of agreements between the governments of Rwanda and the Democratic Republic of Congo (DRC) aimed at resolving the perennial threat to regional stability posed by the armed groups in eastern DRC. DRC's two Kivu provinces are swarming with a variety of such groups, including remnants of Rwandan Hutu army units (ex-Forces armées rwandaise, FAR) and Interahamwe militias who fled across the border after carrying out much of the killing during Rwanda's 1994 genocide; former members of defunct Congolese rebel groups supported by Rwanda during DRC's 1998-2002 civil war, who have resisted reintegration into a new national army; and pro-DRC civil defence brigades loosely grouped as Mayi Mayi. Fighting between one group of recalcitrant rebels, led by General Laurent Nkunda, and the regular army has exacerbated the humanitarian crisis in North Kivu, with 370,000 civilians displaced since December. 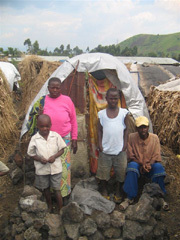 "This commitment appears to be more realistic because a date has been set to prepare a detailed plan for the disarmament and repatriation of Rwandan Hutus," said Henri Kokolo, a researcher in international politics and dean of the Institute of Information Sciences and Communication in Kinshasa, the DRC capital. Representatives from the DRC and Rwandan governments met in the Kenyan capital, Nairobi, on 9 November to bolster at least half a dozen previous, largely ineffective, agreements on the same issue dating back to 1999. Rwanda twice sent its troops into eastern DRC - in 1996 and 1998 - saying its neighbour had not done enough to neutralise the Hutu fighters there. In Nairobi, Kinshasa pledged to "prepare, by 1 December 2007, a detailed plan to disarm and address the threat posed by the ex-FAR/Interahamwe" and to launch military operations to dismantle these groups. In return, Rwanda agreed not to support any armed groups in eastern DRC and to prevent them crossing its border in either direction. The DRC has frequently accused Rwanda of backing Nkunda, a charge denied equally often. The Nairobi meeting was facilitated by the UN, the US Administration and the European Union. UN Secretary-General Ban Ki-moon described the agreement as a "significant breakthrough", saying it offered an opportunity for the comprehensive resolution of problems posed by irregular armed groups in the eastern DRC. Philippe Biyoya, professor of political science at the University of Lubumbashi and the Protestant University of Kinshasa, said support for the agreement from western powers could encourage DRC and Rwanda to match their words with action. "It will surely encourage the two states to refrain from delaying tactics and live up to their commitments," said Biyoya. The EU's Special Representative for the Great Lakes Region, Roland van de Geer, said the EU "feels obliged to engage and has an obligation to make this agreement effective". 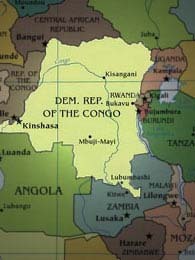 The DRC government said the accord showed it was serious about tackling the armed groups in eastern DRC. "We have put in place the mechanisms for putting a definitive end to these residual forces which have continued to menace our people," the Associated Press quoted Foreign Minister Mbusa Nyamwisi as saying. In Kigali, the Rwandan capital, The New Times, a newspaper close to the government, described the Nairobi accord as "a milestone in the recent history of the region. For the first time in a long time, there is hesitant reason to believe that things may soon be seriously getting better." Under the agreement, the DRC must transfer Rwandan genocide and war crimes suspects to either Rwanda or the International Criminal Tribunal for Rwanda. Both countries must also make it easier for their refugees to return home.